Anderson & Ellis understands that your biggest investment may be your home or business. Our first goal is to establish the highest expectations for considerate, conscientious and straightforward business practice. Our clients consider more than just the cost of a project. 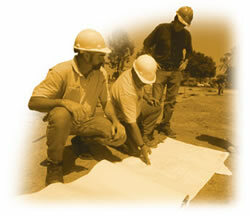 They want the peace of mind that comes with knowing that their builder runs a highly-respected, first-class operation. Our customers also appreciate the benefits of working with a family-owned company, with low corporate overhead. When you combine the Anderson & Ellis hands-on building approach with thorough planning, construction cost savings are maximized. The best opportunity to save $$$ in any building project is during the planning stage. Once construction begins, you can only spend it. The Planning and Design/Build team approach brings the Owner, Architect and Builder into one harmonious relationship for the expressed goal of turning the Owner's dream into reality. From conception to completion, Anderson & Ellis performs all services comprehensively, assuring quality building materials and craftsmanship. Copyright © 2008 Anderson & Ellis, Inc. All right reserved. Designed and hosted by weblix.com.